Muscles are always at least partially contracted. Even seemingly relaxed muscles possess a small degree of tension called resting muscle tonus or tone. This tone is ultimately controlled by impulses from the brain, though special receptors in the muscles themselves are also instrumental in its regulation. The brain relies on input from these receptors as well as those in tendons and joints to give it the information it needs to direct smooth and coordinated muscle movements. They constantly supply the brain with necessary information concerning the ever-changing tone in muscles as well as the present position of muscles at any time during a movement. Many aspects of posture and movement depend on appropriately controlled and subsequently monitored tone in the large postural muscles. Here, we will examine how muscle tone is regulated both by the brain and spinal cord and how the brain is kept informed of the ever-changing status of this tone. A second objective will be to examine spinal reflexes. It is easy for the beginner to treat reflexes lightly, associating them only with visible activities such as the knee jerk. In fact, the vast majority of reflex actions are unseen and unnoticed and yet are vitally important to normal function. Reflexes operating though the spinal cord are responsible for the smooth functioning of the gastrointestinal tract and bladder as well as all of the skilled movements of the trunk and limbs and the often-taken-for-granted activities of standing erect, walking, and running. The muscle tone exhibited by otherwise relaxed muscles is necessary for these muscles to produce effective movements. If muscles relaxed completely (no resting tone), they would overlengthen, and too much time would be required to take up slack when a contraction was called for. On the other hand, too much tone would not allow for sufficient rest and recovery. The principal regulator of muscle tone is the small stretch-sensitive intramuscular unit called the muscle spindle. Muscle spindles are encapsulated units within the belly of a muscle that lie parallel to the muscle fibers, stretching when the muscle is stretched and shortening when the muscle contracts. Thus they are uniquely situated to detect slight changes in muscle tone. When stretched, muscle spindles become activated, causing an increase in the impulse firing rate of afferent nerve fibers from the spindles to the spinal cord. Some of these spindle afferents synapse on second-order neurons which conduct the stretch information up the spinal cord to the cerebellum and even the cerebral cortex. Since the firing rate of these neurons varies with the degree and velocity of stretch, the CNS is continually informed of the ever-changing status of muscle tone and movement. Other spindle afferents directly excite large alpha motor neurons innervating skeletal muscle fibers. This reflex activation causes contraction (and short­ening) of the muscle via the simple myotatic or stretch reflex. This reflex functions as a servo-mechanism to maintain muscle tone at a preset level. If tone in a particular muscle decreases, allowing the muscle to lengthen, the spindles become stretched and trigger increased impulse firing in the spindle afferents, thereby increasing the firing rate of the alpha motor neurons to that same muscle and causing it to contract. The stretch sensitivity of the spindles can be adjusted by action of the small gamma motor neurons in the anterior horn (lamina IX) of the spinal cord. This is an important capability, allowing the CNS to keep the spindles "in tune" with the muscles. These and other functions of the muscle spindles, as well as the tension-sensitive organs in tendons, will be discussed. Muscle spindles are found in all skeletal muscles. They are more highly concentrated in muscle utilizing fine delicate control and less so in the large antigravity support muscles. The greatest percentage of spindles are located in the belly of the muscle. Spindles contain two types of intrafusal fibers. Both types are multinucleated contractile cells (Fig-1). Nuclear bag fibers receive their name from the fact that their nuclei are clustered together in a baglike enlargement near the center of the fiber. Nuclear chain fibers, on the other hand, have no central enlargement, and their nuclei are spread out in a chainlike fashion in the equatorial region of the fiber. Both types are able to contract as contractile myofilaments are present in their striated peripheral portions. Nuclear bag fibers typically have greater diameters and are longer than chain fibers. A typical muscle spindle might contain up to eight chain and one or two bag fibers. The shorter chain fibers are often attached to the bag fibers, which in turn attach to the endomysium of the extrafusal muscle fibers. Extrafusal fibers are the large contractile fibers of the muscle, while the intrafusal fibers are the nuclear bag and chain fibers within the encapsulated muscle spindles. Before examining the role of the muscle spindle in regulating and responding to changes in muscle tone. let's first begin by looking at its neural connections (Fig-2). Each nuclear bag fiber has both motor and sensory innervation. One or two gamma motor neurons form several distinct motor end plates, or plate endings, with the contractile portions of the fiber. 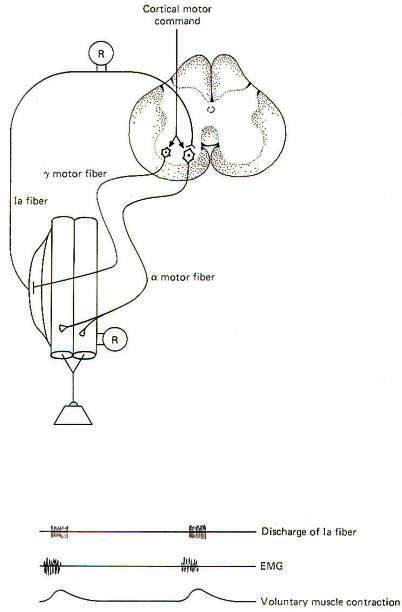 Firing of the gamma fibers contracts and shortens the bag fibers, a feature which we will see is important in setting the sensitivity of the spindle. Stretch of the nuclear bag fibers is detected by specialized stretch-sensitive endings of both group Ia and group II nerve fibers. 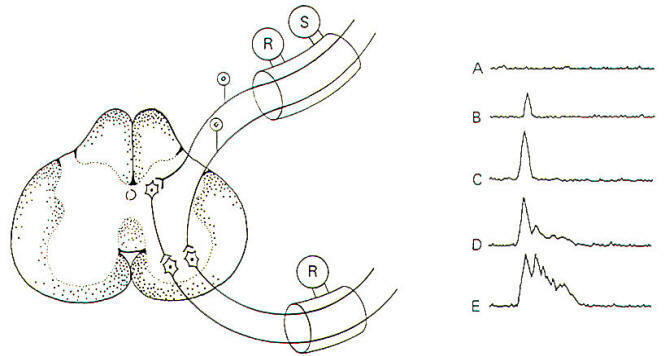 The Ia fibers form primary endings (annulospiral endings) by wrapping around the central region of the bag fibers. Group II fibers form secondary endings (flower-spray endings) over the striated portions of the bag fibers. The nuclear chain fibers also have both motor and sensory innervation.Very small gamma motor neurons form rather nondistinct trail endings on the contractile portion of the chain fibers rather than the more distinct plate endings of bag fibers. Group Ia and II nerve fibers also form primary and secondary endings with the chain fibers. When a muscle is stretched, the spindles in that muscle are also stretched. 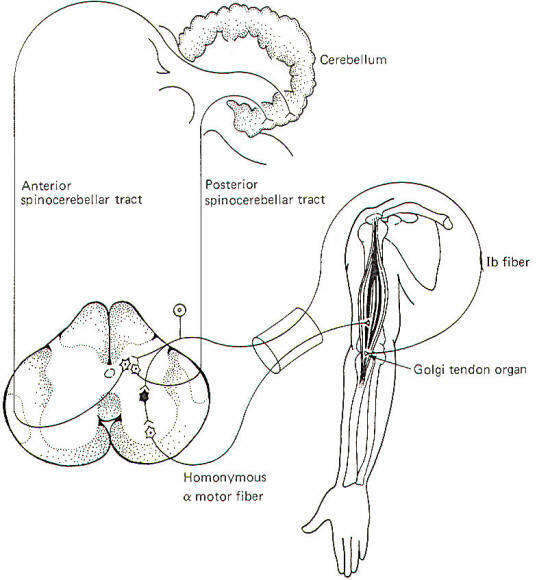 Stretch of the nuclear bag and chain fibers in the spindles stimulates the primary and secondary endings of the Ia and II afferent fibers, causing them to send impulses into the cord. 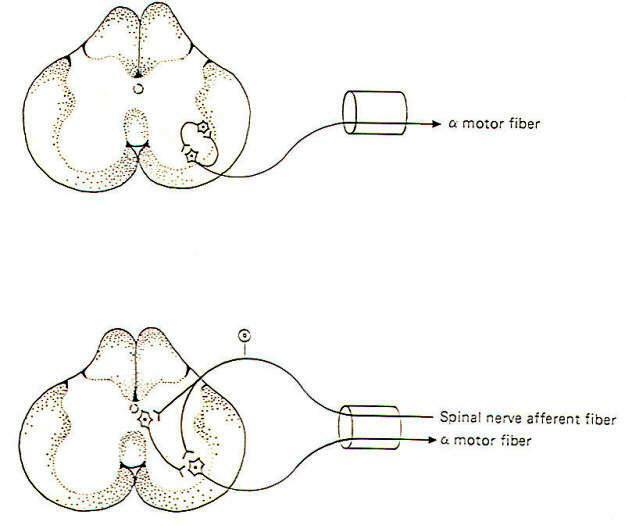 Many of these fibers (particularly the Ia fibers) synapse directly on alpha motor neurons supplying the same muscle which was initially stretched. This causes the muscle to contract and shorten, relieving the initial stretch. Such neurons are called homonymous alpha motor neurons. This "stretch-resulting-in-relieved-stretch" is known as the myotatic or stretch reflex. Once the muscle contracts and the stretch is relieved, the firing rate of the spindle afferents returns to the resting level (Fig-3). Skeletal muscles are attached to the skeleton in order to bring about movements of the body. It is usually necessary for muscles opposing a reflex movement (antagonists) to relax while those producing the movement (agonists) contract. This reciprocal action requires the incorporation of inhibitory interneurons in the spinal cord. Branches (collaterals), typically from the Ia spindle afferents, synapse in the posterior horn of the spinal cord gray matter. Here they stimulate inhibitory interneurons which depress activity in the alpha motor neurons to those muscles antagonistic to the desired movement. The patellar tendon or knee jerk reflex illustrates this point in Fig-4. When the tendon is tapped with a reflex hammer, the anterior thigh (quadriceps) muscles and many of its muscle spindles are stretched. Accordingly, volleys of impulses are sent into the spinal cord over the spindle afferents. Those fibers synapsing directly on homonymous alpha motor neurons bring about contraction of the quadriceps, causing the leg to kick in the classic response. Of course the posterior thigh muscles (hamstrings) must relax in order to allow this to happen. This is accomplished by spindle afferent stimulation of inhibitory interneurons (Renshaw cells). Once activated, they depress firing in the alpha motor neurons to the antagonistic muscles. Renshaw cells release the inhibitory neurotransmitter GABA at their synapses. Notice that the same spindle afferents which increase the firing rate in the homonymous alpha motor neurons decrease activity in the antagonistic motor neurons. The latter is accomplished through "feed-forward" inhibition. Keep in mind that the spindle afferents are excitatory neurons releasing ACh at their synapses. The desired inhibition of the antagonistic alpha motor neurons is "fed forward" through the inhibitory interneuron, the Renshaw cell. Up to this point we have only been concerned with the action of the muscle spindle afferents on alpha motor neurons. Now let's examine how the sensitivity of the spindles can be adjusted to maintain a preset level of muscle tone. Recall that the spindle afferents are stimulated whenever the intrafusal fibers are stretched taut. 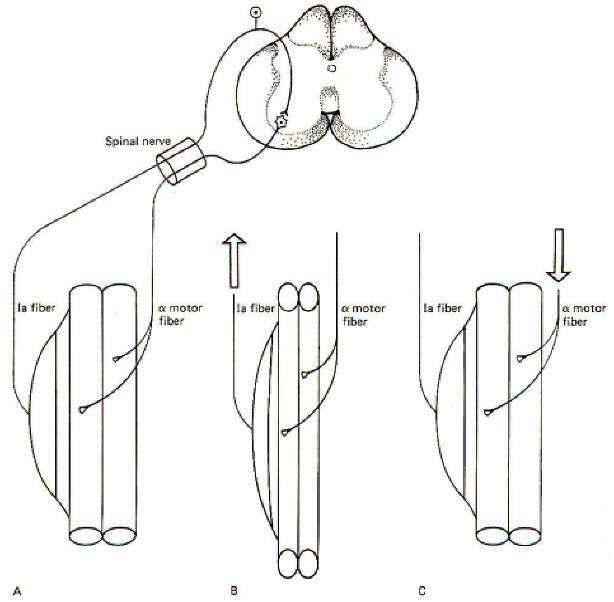 Now if the intrafusal fibers are already partially contracted, only a slight amount of stretch is needed to pull them taut, increasing the firing rate of the spindle afferents. On the other hand, if the intrafusal fibers are relaxed and slack, a considerably greater stretch of the muscle is needed in order to pull them taut and fire the spindle afferents. In other words, the muscle spindle is more sensitive to stretch when its intrafusal fibers are partially contracted then when they are not. The degree of contraction of the intrafusal fibers and thus the sensitivity of the muscle spindle is controlled by the activity of the gamma motor neurons. The greater the firing rate of the gamma efferents, the greater the degree of intrafusal contraction, and the greater the sensitivity of the spindle. Recognize that when muscles isotonically contract they shorten. Similarly, relaxation causes them to lengthen. Now let's assume that a given muscle is set to maintain a certain degree of contraction or tone. If the muscle relaxed too much it would lengthen and its spindles would stretch, initiating the stretch reflex. This would cause the muscle to contract, thereby relieving the stretch brought on by the initial relaxation. Similarly, if the muscle contracted too much, it would shorten and its spindles would become increasingly slack. This would decrease the stimulation of the spindle afferents, thereby decreasing the stimulation of the homonymous alpha motor neurons and causing the muscle to partially relax. As a result of this "servomechanical" nature of the muscle spindles, muscle tone remains very constant at any preset level. Increases in tension are reflexly countered by relaxation, while decreases in tension are countered by contraction. It is important to recognize that tone is regulated by the stretch reflex and is not a characteristic of the muscle itself. This can be demonstrated by the immediate loss of muscle tone which occurs when the reflex arc is interrupted at any point. For example, sectioning either the anterior or posterior roots of spinal nerves results in the immediate loss of tone to all those muscles involved. In order to remain sensitive to the slightest change in muscle tone it is important that the spindles not be allowed to go completely slack. Under normal conditions intrafusal spindle fibers are partially contracted. In this state, a slight relaxation or stretch of the muscle will be detected by the spindles as will a slight contraction or shortening. The firing rate of the spindle afferents will increase or decrease accordingly, and the spindles are said to be "in tune" with the muscle. One of the important roles of muscle spindles is to keep the brain and particularly the cerebellum continually informed of even slight changes in muscle tone. This is accomplished via collaterals from the spindle afferents which synapse on neurons of the spinocerebellar tracts. The second-order neurons of these tracts conduct information concerning the state of muscle tone and movement to this important coordinating center of the brain (Fig-7). Now consider what would happen if the motor cortex of the brain directed a particular muscle to maintain a higher level of contraction (tension). Without a simultaneous contraction of the spindle intrafusal fibers in that muscle, the spindles would go slack and the firing rate of the spindle afferents would drop off to zero, producing a "silent period." Consequently, the spindles would no longer be able to detect slight increases or decreases in muscle tone and they would be "out of tune" with the muscle (Fig-5). If, as neurophysiologists suspect, detecting slight changes in muscle tone is an important feature of muscle spindles. these would no longer be contributing, and the cerebellum would be out of touch with tension changes in the muscle. Fortunately, activity in the gamma efferent nerve fibers prevent this from happening by increasing the degree of intrafusal fiber contraction at approximately the same time that the alpha motor neurons contract the extrafusal fibers. By this "coactivation" of alpha and gamma motor neurons, spindles are kept "in tune" with their muscles (Fig-6). The role of the gamma efferents in adjusting the sensitivity of the muscle spindles has already been discussed. The basal rate of firing of the gamma efferents and, through them, the contractile state and sensitivity of the spindles are regulated by the brain through pathways descending in the spinal cord. The principal route is the medial reticulospinal tract. This tract, which originates in the reticular formation of the brainstem, receives input from many areas of the brain, including the cerebral and cerebellar cortexes. The cerebellum is an important center for the central coordination of muscle activity. As such, it is necessary for the cerebellum to be continually informed of progressing body movements and changes in muscle tone. As previously mentioned, this is accomplished by collaterals from the spindle afferents which synapse in the nucleus dorsalis of the spinal cord. 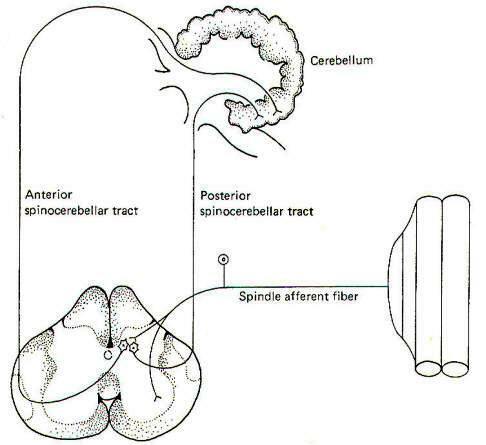 Some of the second-order nerve fibers from this nucleus ascend the cord in the posterior spinocerebellar tract (PSCT) to enter the cerebellum via the interior cerebellar peduncle on the same (ipsilateral) side of the body as the entering spindle afferents. They terminate in the cerebellar cortex of the vermis (Fig-7). Other second-order nerve fibers from the nucleus dorsalis cross over to the opposite (contralateral) side of the spinal cord and ascend to the brainstem in the anterior spinocerebellar tract (ASCT), where they cross back to enter the cerebellum via the superior cerebellar peduncle and terminate in the vermal cortex. By "tapping off " the signals from the spindle afferents and conducting them cranially over these pathways, the cerebellum is continually kept informed of the ever-changing status of muscle tone. Electrophysiological studies indicate that group II fibers appear to be concerned with relaying information concerning changes in muscle length, while Ia fibers are concerned with changes both in length and contraction velocity. It is important to recognize that the cerebellum functions as a coordinator examining the performance of a muscle during a given movement and comparing it with the intended movement directed by the cerebral cortex. If the intended performance and the actual performance don't match up exactly, the cerebellum can take corrective action to synchronize them through its own output to the motor system. Therefore it is important for the cerebellum to continually receive input from the muscle spindles on the progression of any given movement. Input from Golgi tendon organs and joint receptors is also necessary for movement coordination. The tendons of skeletal muscle contain special receptors called Golgi tendon organs. These receptors are sensitive to the changes in tension generated by muscles as they contract. Little is known about their structure except that they are in intimate contact with the peripheral endings of group Ib afferent fibers. It is through impulses generated in these afferent fibers that changes in muscle tension detected by the tendon organs are relayed to the spinal cord and brain. 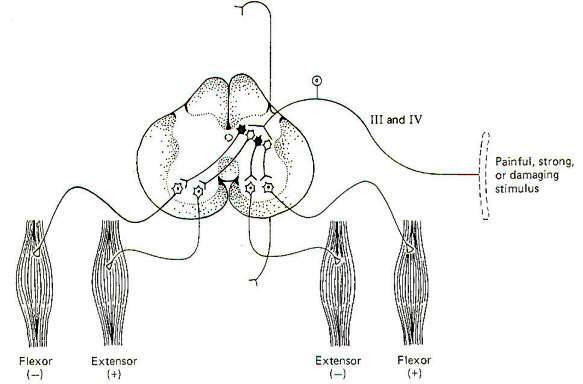 As muscles contract and tension is applied to their tendons, the tendon organs are stimulated, which in turn propagate impulses over group Ib fibers into the cord, where they take several divergent routes (Fig-8). The sensitivity of the tendon organs is considerably less than that of the muscle spindles. As little as 1 or 2 g of tension is sufficient to increase the firing rate of the spindle afferents. On the other hand, the group Ib afferent fibers from the tendon organs don't register impulse conduction until the tension reaches as high as 100 g. When tension in the tendons begins to exceed this level, the tendon organs become sufficiently stimulated to produce impulse firing in the group Ib fibers. Like the spindle afferents, the group Ib fibers send collaterals into the nucleus dorsalis of lamina VII of the spinal cord gray matter. Subsequently, both ASCT and PSCT second-order neurons conduct information from the tendon organs to the cerebellum. If the tension developed in a strongly contracting muscle becomes excessive, it is not inconceivable that the tendon could pull free from the bone, certainly an undesirable situation. However, before this can happen the tendon organs become sufficiently stimulated to send large volleys of impulses into the cord to directly stimulate the alpha motor neurons to antagonistic muscles and inhibitory interneurons to homonymous alpha motor neurons. The resulting feed-forward inhibition to the strongly contracting muscle causes it to suddenly relax, relieving the strain on the tendon and preventing possible damage. This sudden relaxation of a muscle in the face of dangerously high tension is called the lengthening reaction or the "clasp-knife" reflex because of its similarity to the way a pocketknife suddenly snaps closed when the blade is moved to a certain critical position. It was originally thought that little if any information from the tendon organs or the muscle spindles reached the conscious level in humans. The vast majority of the signals from these receptors which ascend the cord were thought to be directed exclusively to the cerebellum for subconscious evaluation. However, recent evidence now indicates that input from muscle spindles, tendon organs, and joint receptors is also relayed to the cerebral cortex and is probably responsible for the conscious sensation associated with the position and movement of limbs. A reflex can be defined as a specific response to an adequate sensory stimulus. Strictly speaking, this response most often involves a muscular contraction or a glandular secretion. The spinal reflexes we will examine here all involve muscular contractions. A reflex arc is the neural circuit over which the reflex operates (Fig-9). In its simplest form it involves an afferent neuron conducting impulses from the point of stimulation into the spinal cord and an efferent neuron conducting impulses out to an efferent muscle or group of muscles. This is a monosynaptic or simple reflex because it utilizes only two neurons and one synapse. If one or more interneurons in the cord link the afferent and efferent fibers, the reflex is polysynaptic. If the afferent and efferent fibers occupy one or just a few cord segments the reflex is segmental. Intersegmental reflexes involve several cord segments. If centers in the brain are included in the reflex pathway. the reflex is supraspinal. We noted earlier that it is easy to underestimate the importance of reflexes. For example, one tends to think of a simple act such as setting a dinner plate on the table as a purely voluntary act directed exclusively by the conscious motor cortex of the brain. In fact, however, the successful completion of this simple task requires the additional input of polysynaptic reflexes of the segmental, intersegmental, and supraspinal types. Most of the neural circuits making up such reflexes are very complex and poorly understood. Nevertheless, they undoubtedly involve special application of certain basic reflex types such as the stretch reflex and others. Let's look at an example of a somewhat complex spinal reflex which is at least partially understood. A strong, painful, or potentially damaging stimulus delivered to cutaneous or joint receptors can reflexly cause a sudden bodily withdrawal away from the stimulus. Stepping on a tack is a good example of this reflex in action. The person will typically flex (withdraw) the stimulated foot and leg while extending the other leg in order to propel the body away from the tack. This is a polysynaptic, bilateral reflex incorporating both excitatory and inhibitory interneurons. Delivery of the stimulus to the receptors in a limb increases the firing rate of pain-carrying group III and IV afferents into the posterior horn. where they synapse with interneurons (Fig-10). Excitatory interneurons ipsilaterally stimulate alpha motor neurons to the flexors in that limb while contralaterally stimulating extenders in the opposite limb - thus the term flexor-crossed-extensor reflex. At the same time, inhibitory interneurons ipsilaterally inhibit extenders of the stimulated limb while contralaterally inhibiting flexors of the opposite limb. This reflex is often intersegmental. This should not be surprising when one considers that many muscles are involved in such movements. In the cat, for example, a painful stimulus delivered to one hind leg will not only reflexly withdraw that leg, but will extend to both hind legs and forelegs on the opposite side as well. This means that the group III and IV afferents not only stimulated interneurons at the same segmental level at which they entered the cord, but activated synapses at higher and lower cord levels as well. The ascending and descending collaterals travel in the fasciculus proprius (ground bundles) of the white matter. The fibers in these tracts carry intersegmental connections. Neuronal synaptic connections in the spinal cord are difficult to examine experimentally because of their great density and complexity. The peripheral fibers of a reflex are much easier to study. 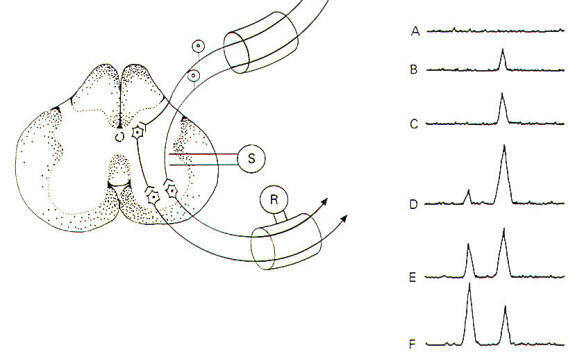 Consequently, some knowledge concerning synaptic activity in the cord can be obtained by electrically stimulating afferent fibers while recording from synaptically stimulated efferent fibers. 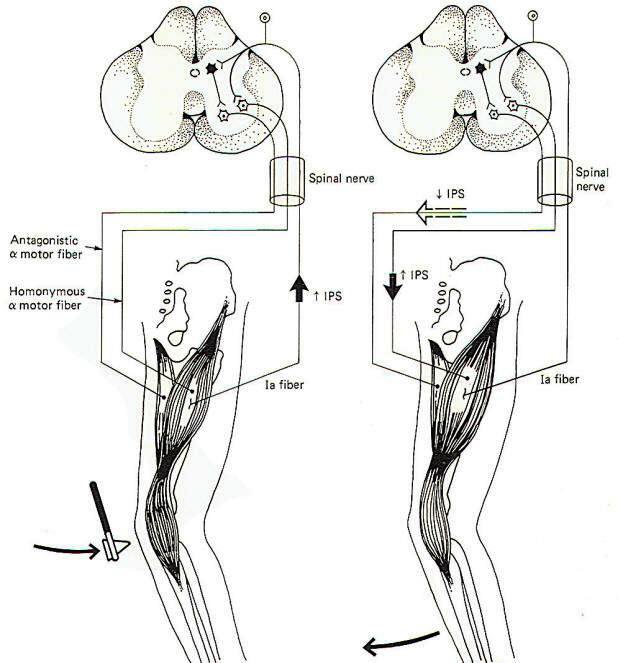 When afferent nerve fibers in the posterior root are repetitively stimulated by an electronic stimulator, compound action potentials can be recorded from anterior root fibers (Fig-11). The afferent nerve fibers stimulate anterior root neurons either directly or indirectly. which then conduct recordable impulses out their efferent fibers. 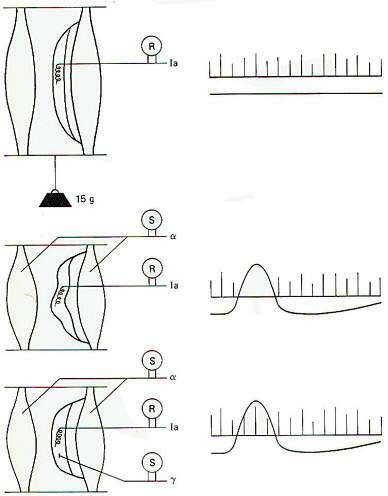 A compound action potential is the sum of several individual action potentials. It is obtained when action potentials from several nerve fibers are recorded simultaneously with the same recording electrodes. Notice that when the stimulus is small, the compound action potential is also small. With increases in stimulus strength, more posterior root neurons and hence more anterior root neurons are excited and the size of the action potential increases. With yet further increases in stimulus strength, two observations can be made. First, there is again an increase in the size of the compound action potential as more neurons are recruited, and secondly we see the appearance of slightly delayed potentials. These latter potentials are due to polysynaptic relays. Because of the delay caused by the additional synapses. the resultant impulses reach the recording electrodes later than the monosynaptic relays. These polysynaptic responses do not appear if the stimulus strength is too low because of the failure to sufficiently stimulate the interneurons. The more interneurons involved, the stronger the initial stimulus needs to be in order to maintain excitability through the multiple synapses. As the stimulus strength is still further increased, relays involving even greater numbers of synapses are recruited. Finally, when the posterior root neurons are maximally stimulated, the response will level off and further increases in stimulus strength will not change the magnitude of the response. When the stimulating electrodes are placed into the lateral region of the spinal cord itself, stimulation directly excites both afferent neurons and interneurons (Fig-12). By painstaking and careful placement of these stimulating electrodes, only one synapse separates the afferent neurons and interneurons from the efferent neurons of the anterior horn. As the stimulating current is increased, both afferent neurons and interneurons will be sufficiently stimulated to conduct impulses to their synapses and excite the alpha motor neurons so that compound action potentials are recorded in the anterior root. As the stimulus strength increases, more and more afferents and interneurons are stimulated and the size of the compound action potential is observed to increase also. With still further increases in stimulus strength, some of the anterior motor neurons are stimulated directly by the electrode current spread through the cord. Since no synapses are involved in this instance, an earlier compound action potential is also recorded. The difference in time delay between the appearance of these two action potentials represents the synaptic delay. Values of 0.5 ms are typical in this kind of experiment. The delay represents the time it takes for Ca2+ ions to enter the presynaptic terminal and bring about the subsequent release of neurotransmitter, followed by diffusion across the cleft and activation of receptor sites on the postsynaptic membrane. Still further increases in the stimulus strength produce an increase in the amplitude of the first potential and a decrease in the amplitude of the second potential because of the interneurons finding the motor neurons in a refractory state. Nerve cell axons often branch into hundreds and even thousands of neuronal filaments before synapsing with other neurons. As many as 100 neurons are often supplied by a single axon in this manner. Some of these postsynaptic neurons receive many synaptic inputs from a single presynaptic neuron while others receive only a few. All of the nerve cells which receive synaptic input from a single presynaptic neuron make up the neuronal pool of that neuron. When a neuron supplying a neuronal pool is firing impulses repetitively. some of the neurons in the pool are sufficiently stimulated to establish EPSPs of threshold level, while others (those receiving few synaptic inputs from the neuron) are not. 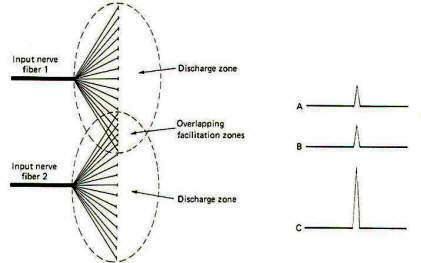 Those stimulated to threshold level are in the liminal or discharge zone of the pool, while the others are in the subliminal or facilitation zone (Fig-13). Neuron pools overlap. That is, some of the neurons in the neuronal pool of one input neuron are likely to be included in the neuronal pool of a second and even a third and fourth input neuron. 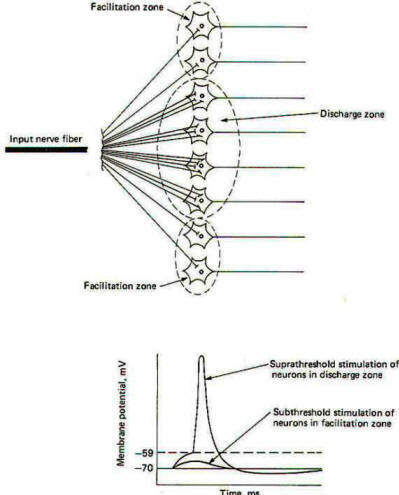 While the neurons in the facilitation zone of one input neuron are not sufficiently stimulated to reach threshold by the action of that neuron alone, they may be raised to the excitation threshold and begin to fire impulses if they are also in the facilitation zone of a second simultaneously firing input neuron (Fig-14). This phenomenon is called facilitation. Facilitation in this case means that the postsynaptic output from a neuronal pool evoked by the simultaneous firing of two input neurons is greater than the sum of each fired separately. 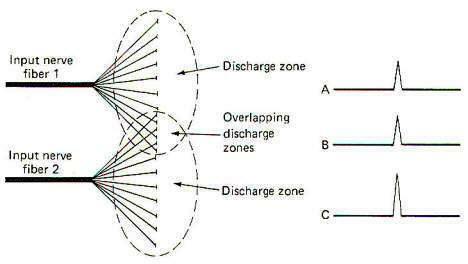 When the discharge zones of two neuronal pools overlap, the opposite effect is observed. In this case the postsynaptic output from a neuronal pool evoked by the simultaneous firing of two input neurons is less than the sum of each fired separately (Fig-15). This is called occlusion. Convergence and divergence are important means by which the central nervous system channels and sorts different information. There are many examples of each throughout the nervous system. Synaptic input to the large alpha motor neuron in the spinal cord anterior horn is a good example of convergence (Fig-16). We see that several nerve fibers converge on the motor neuron. each exerting some measure of influence over the central state of this cell. The primary sources are probably the corticospinal tract fibers from the brain. However, we also know that it receives input from the spindle afferents, group Ib fibers from Golgi tendon organs, Renshaw cells, and several other pathways descending in the spinal cord. Because of this funneling of input. 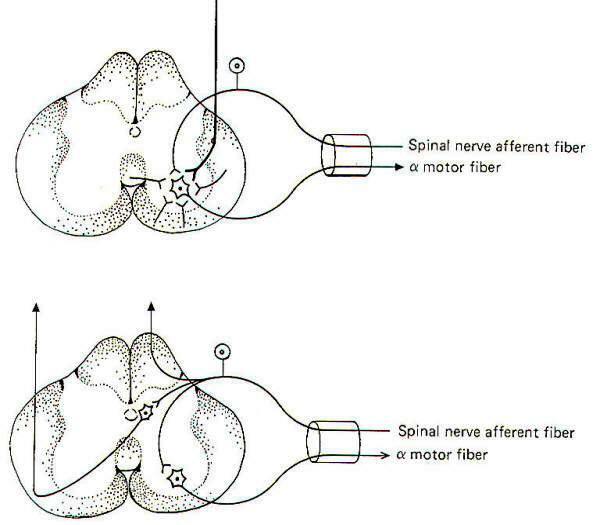 Sherrington has called the motor neuron the final common pathway in motor output. Remember that the firing rate of a neuron depends on the level of its central excitatory state (CES). The higher the CES in excess of the excitation threshold. the higher the firing rate. Of course if the CES is less than the excitation threshold, the motor neuron will not fire at all. It is often important that information arising in one area of the body be transmitted to several different regions in the nervous system. 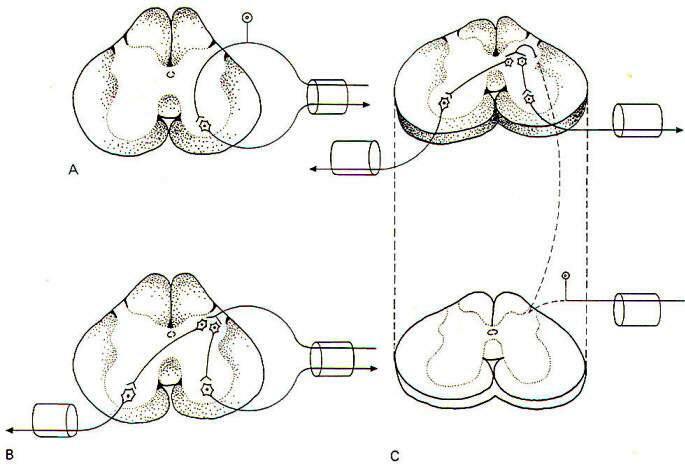 This spread of information is accomplished by the process of divergence, Figure 4-16 illustrates the divergence of signals entering the spinal cord via a spinal afferent fiber which diverges and takes three separate routes. Two of these are directed cranially via ascending pathways in the spinal cord. while the third is routed to a spinal reflex. In another respect, the transmission of impulses from a single input neuron to the various neurons in its neuronal pool is also divergence. It is easy to picture neurons lined up in single file with the first stimulating the second and so on. In nature, however, neural pathways are typically more complex. Two exceptions to the single-file concept are illustrated in Fig-17. In a parallel circuit, an incoming neuron stimulates a second neuron both directly and indirectly (via one or more interneurons). Consider a neuron (A) which directly excites a neuron (B) through an excitatory synapse. In addition, neuron A stimulates an interneuron (C), which in turn excites neuron B. It should be apparent that if neuron A is stimulated, recording electrodes placed on neuron B will register two spikes. The first is caused by neuron A directly stimulating neuron B, and the second is caused by the delay through the interneuron C synapse. The delay of this afterdischarge (second spike) is determined by the number of interneurons involved in the parallel circuit. The interneurons may be excitatory or inhibitory. When a collateral branch of a neuron synapses with an interneuron which then returns to resynapse with itself, either directly or indirectly, a recurrent circuit is formed. Like parallel circuits, recurrent circuits may be either excitatory or inhibitory.